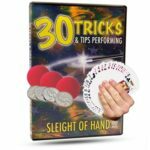 With 30 Tricks and Tips with Sleight of Hand by Magic Makers, you will learn from the best! Follow step-by-step, as Eddy Ray teaches you how to use sleight of hand to perform powerful magic. You can learn how to perform tricks with coins, sponge balls and even cards. Sleight of hand is a foundational part of magic. Learning how to manipulate cards and coins will allow you to easily learn more tricks as you grow as a magician. Follow along as expert Eddy Ray teaches you how to master Sleight of Hand.